Billy was asked by so many people after the tragic death of Marco Simoncelli to prodcue a print that the free download (still available below) was produced as Billy didn't want to capitalise on Marco's very sad passing. To date over 25,000 people have downloaded the free print. But now there is a special 'Fading' edition prodiced to the very high standards of Billy's limited edition prints that will be given to every online or bike show purchase while stocks last. The edition is of 580 (1 and 58 have gone), all signed and numbered. Billy's prints covering Moto GP, WSBK, BSB and Road Racing are all here and new editions will be available throughout the year. But once the Simoncelli special print is gone it is gone. So pass on this information to your bike fan friends to gain one of these unique Marco Simoncelli limited editions. To download your free Marco Simoncelli print by Billy alt click (or cntl click) for Mac users. Right click and save target as for PC users. Marco Simoncelli by Billy is licensed under a Creative Commons Attribution-Noncommercial-No Derivative Works 3.0 Unported License. Full Terms and Conditions for the Marco Simoncelli Print by Billy are at the bottom of the page. You may download this Marco Simoncelli memorial fine art print by Billy and print it off for your own use and pleasure to give as a gift to a family member, friend or colleague. This Marco Simoncelli memorial fine art print by Billy must not be reproduced for commercial resale purposes in any form. If you are charged for this Marco Simoncelli memorial fine art print by Billy then please report the infringement use to your local trading standards office and Billy. The Marco Simoncelli memorial fine art print image may be used in magazine or web articles if talking about Billy the Artist and his work or if letting others know about the free Marco Simoncelli . 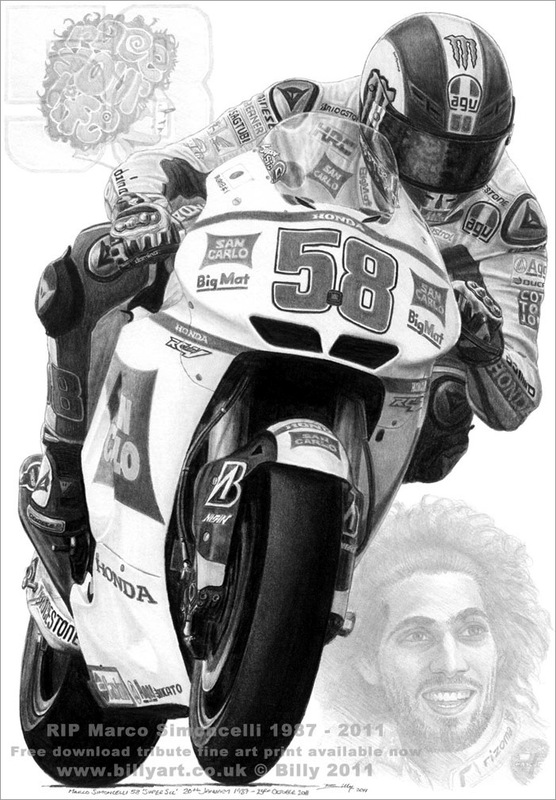 Always credit Billy as the artist of 'Marco Simoncelli' memorial fine art print pencil sketch with a link to the free Marco Simoncelli memorial fine art print page URL at the bottom or a direct link to Billy's website home page if space doesn't allow. DO NOT post the Marco Simoncelli memorial fine art print to be downloaded from any other site. 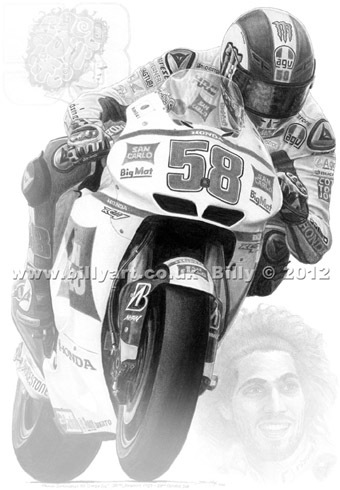 ALWAYS put a link to the Marco Simoncelli memorial fine art print download page on Billy's website. URL link to the Marco Simoncelli page below. The Marco Simoncelli fine art print by Billy is for personal and non commercial uses only. Contact Billy if you wish to use his Marco Simoncelli image commercially for any reason.